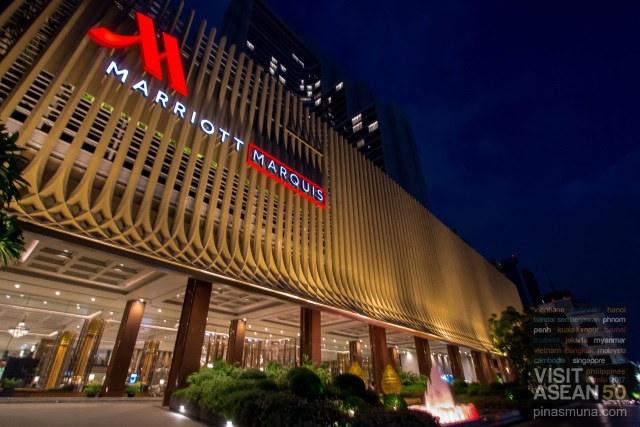 Bangkok Marriott Marquis Queen's Park is an iconic luxury hotel located in the Khlong Toei district of central Bangkok. 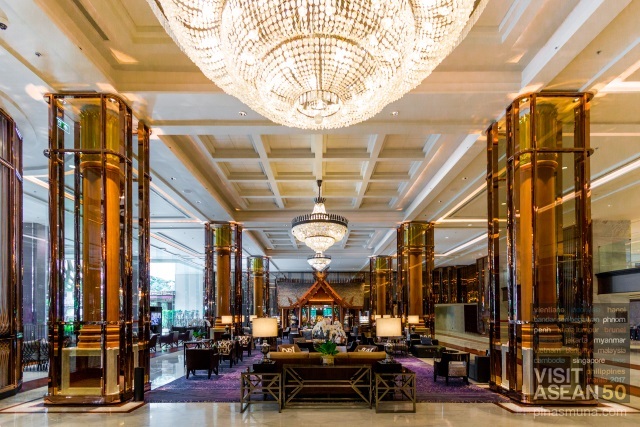 Formerly called Imperial Queen's Park Hotel, the property underwent extensive renovation and reopened in December 2016 as Bangkok Marriott Marquis Queen's Park, making it the first and only Marriott property in the Asia-Pacific region with the Marquis brand designation. This larger-than-life hotel is grandiose in many aspects of its details. The grand lobby itself can easily fit two basketball courts, with enough space to accommodate the arrival or large groups of guests. 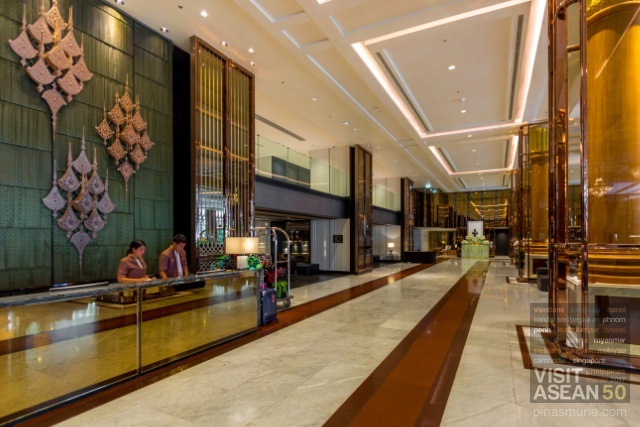 Most notable features of the lobby are the massive pillars encased in glass with copper frames. Elements of Thai design are also integrated into the interior of the lobby, such as the wooden artwork mounted on the feature wall of the concierge. 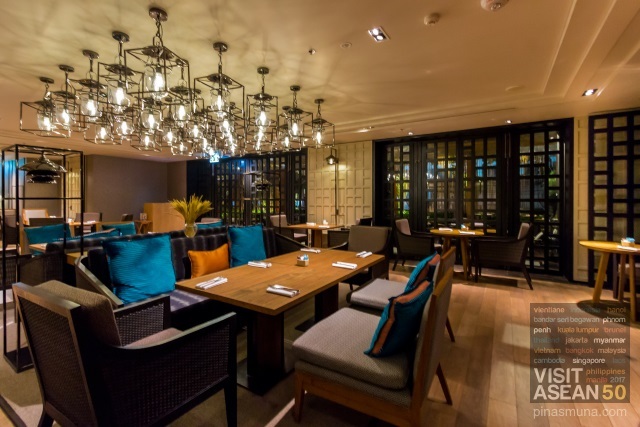 Goji Kitchen + Bar is the all-day dining restaurant of Bangkok Marriott Marquis Queen's Park. 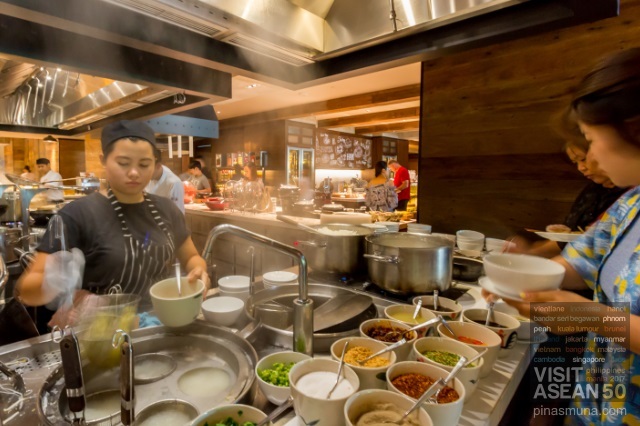 It serves international buffet for breakfast, lunch and dinner prepared fresh and served through its interactive open kitchens. A la carte dining is also available. 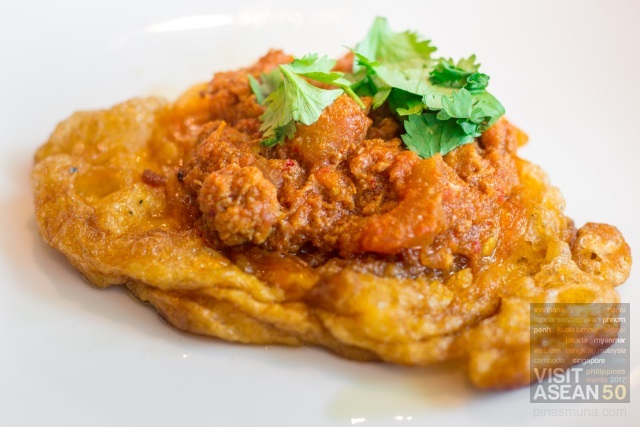 Goji Kitchen + Bar specializes in parrilla-grilled meats and ocean-fresh seafood. Siam Tea Room is a combination of a casual dining restaurant, a cafe and a deli shop. Siam Tea Room serves authentic Thai cuisine as well as Western style pastries, desserts and espresso-based beverages. The deli section showcases freshly baked goods, Thai coffee and tea products, and other local Thai delicacies and souvenir items. 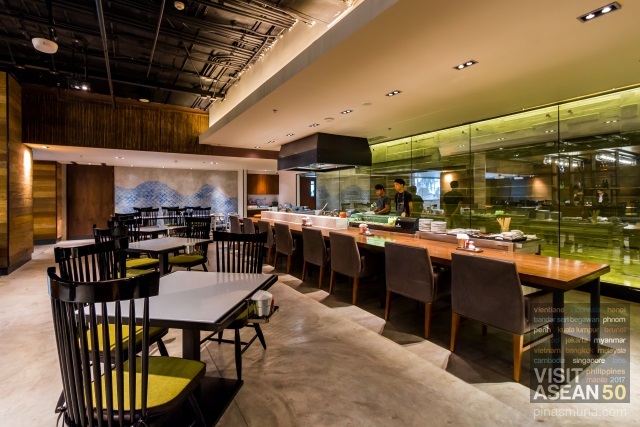 The first of its kind in Bangkok, the Soba Factory serves a selection of dishes made with homemade Japanese soba noodles. The menu also includes grilled yakitori skewers as well as set lunches and dinners. Complete the Soba Factory experience with premium Japanese green teas, beers, sakes and whiskies. Guests who booked the Stay for Breakfast enjoy complimentary breakfast buffet for two persons at Goji Kitchen + Bar. The international spread includes Thai, Japanese, Chinese, Korean, American and Continental breakfast items. Dishes can also be customized at the live cooking stations. Goji Kitchen + Bar also welcomes walk-in guests. Fitness Center - fully equipped with the latest, state-of-the-art work out machines and free weights. The gym is open 24 hours so you can work out at your most convenient time. The gym also has a steam room and dry sauna. 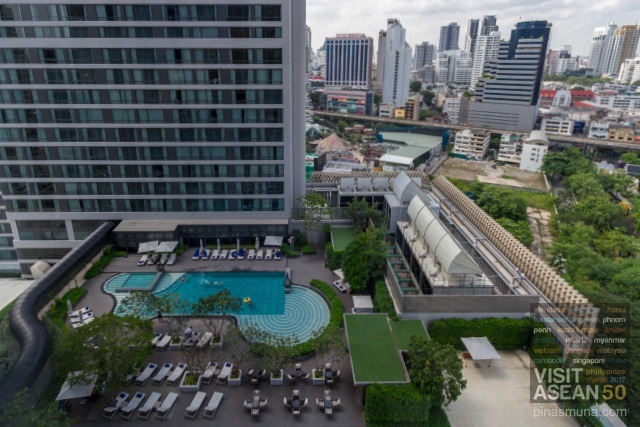 Bangkok Marriott Marquis Queen's Park is centrally located along Sukhumvit Soi 22 Road accessible via the famous Sukhumvit Road. 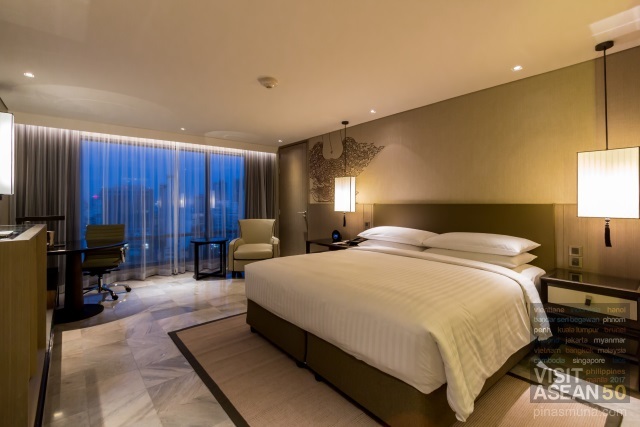 The hotel is surrounded by public parks, high-end malls, restaurants, offices and entertainment establishments. 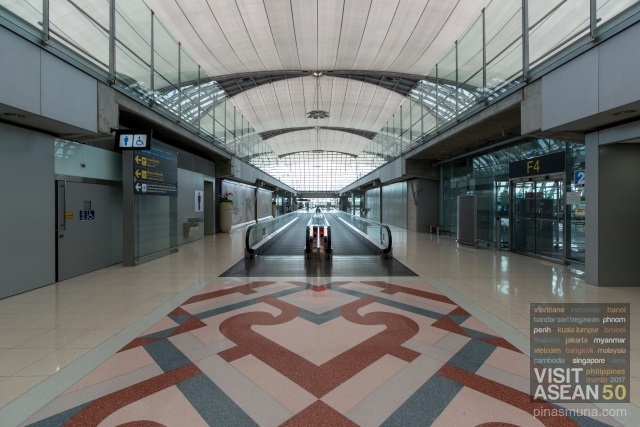 Airport Transfer - Bangkok Marriott Marquis Queen's Park is located about 42 kilometers from Suvarnabhumi Airport (BKK) and 35 kilometers from Don Muaeng International Airport (DMK). A comfortable and affordable way to reach the hotel from the airports is by booking a Grab Car or Uber from your smart phone. Fare ranges from THB400 to THB450 (US$12-14) which already includes toll. A more convenient alternative is to book the hotel's limo service at THB2,500 (US$75.00) per way, prior to your arrival. Getting Around - the most recommended way to go around the city is by taking a Grab Car via the Grab Car mobile application. Even the locals prefer this than taking a taxi because it is reliable and service is much better. Just make sure you have mobile data then you are good to go. If you don't have mobile data, then your next best choice is the regular taxi. Make sure (insist in some cases) that the driver uses the taxi meter. Don't agree on a fixed price. If you are looking for more adventure, you can try the BTS Skytrain and the MRT Underground. The nearest station to the hotel is the Phrom Phong BTS Station. 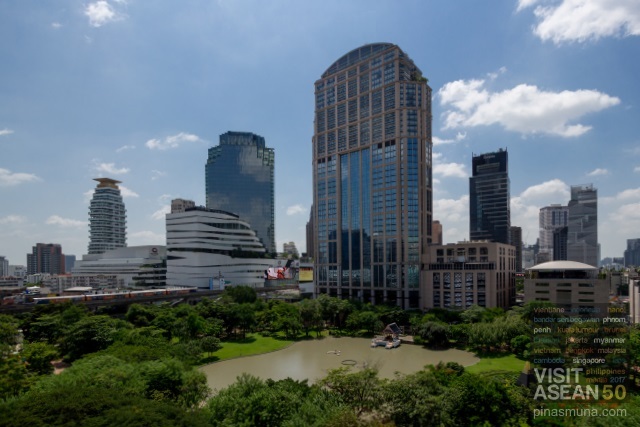 Attractions - Bangkok has a lot of green spaces especially in public parks, the nearest park from the hotel is the Benchasiri Park which is a popular destination for morning jogging and afternoon picnics. Popular attractions such as The Grand Palace, Wat Pho and Wat Suthat are reachable by public transport. Shopping - Sukhumvit Road is popular for high-end shopping and some of the best malls are located near the hotel, such as The Emporium and the EmQuartier. If you are looking for great bargains, you can check-out Silom Night Market and Chatuchak Night Market. Always try to haggle as you can buy most items for up to 50% of the original price.